Findings from a survey of physicians from three academic tertiary centers reflect variability in how brain death is determined, suggesting the need for formalized training around a standard protocol for those who perform these assessments as part of their routine clinical practice. Of particular concern to experts in neurocritical care is the fact that 10 percent of respondents did not perform an apnea test. There appears to be substantial variability in the way physicians approach brain death assessments and a need for more formalized training, according to the results of a survey published in the January 25 online issue of Neurology. The survey results extend previous research that has shown substantial variability in brain death policies from hospital to hospital. Most striking was a finding indicating that a little more than 10 percent of survey respondents did not complete an apnea test. Moreover, nearly one in four of the respondents indicated they did not receive formal training in brain death assessments. Indeed, survey results regarding use of ancillary tests in brain death determinations suggest that some physicians are unfamiliar with their own hospital protocols. A position statement on brain death determinations approved this year by the AAN and published in the January 2 online edition of Neurology also called for uniform training and standardized protocols. “Some physicians who indicate they perform brain death examinations in practice may have an incomplete understanding of the clinical examination, as well as indications for confirmatory testing,” lead author Sherri Braksick, MD, assistant professor of neurology at the University of Kansas Medical Center, told Neurology Today. Dr. Braksick and colleagues invited physicians at three academic tertiary centers by email to participate in the survey. Invitations with a link to the survey were sent to all individual department or division chairs and administrative assistants for distribution to all attending physicians, fellows, residents, and interns. Participants were asked if they performed brain death examinations on adults in clinical practice and what neurological examination components they assessed as part of the brain death examination. The survey also inquired about the use of ancillary tests and the rationale for when a test was ordered. Participants were excluded if they reported that they did not perform adult brain death examinations as a part of their clinical practice, regardless of their reported specialty. A total of 68 respondents from 23 departments reported completing brain death examinations in clinical practice and were included in the final data analysis. Attending physicians comprised the majority of the respondents (61.8 percent), followed by residents (29.4 percent), fellows (7.4 percent), and interns (1.5 percent). Most of the respondents (77 percent) were neurologists, neurosurgeons, or neurocritical care specialists. One third of physicians surveyed about their practice of brain death determinations reported obtaining ancillary testing automatically, regardless of clinical examination findings. “This behavior may result in situations where a clinical examination is consistent with brain death, but the ancillary test is inconclusive or falsely positive,” the authors of the study wrote. Moreover, 10 of the 20 physicians who indicated they ordered ancillary testing as part of a standard evaluation said they did so because it was required by their hospital policy. Dr. Braksick and colleagues reviewed policies at the three surveyed sites and found in fact that none require automatic ancillary testing as part of the brain death assessment in an adult, indicating that they were unfamiliar with local policies by some of the participating physicians. Survey participants were asked to indicate which components of a standard brain death examination, as outlined in the AAN guideline, they regularly perform. Slightly more than a quarter (26.5 percent) of physicians reported checking peripheral reflexes (patellar, etc. ), and 23.5 percent reported evaluation of the plantar response/Babinski sign during a brain death examination, neither of which is indicated in AAN guidelines. Experts interviewed by Neurology Today agreed that the survey, although small, highlights the need for standardization of training and protocols. “Even though it is limited in scope in terms of response and the number of centers surveyed, the study highlights the wide variability on the ground in brain death assessment,” Dr. Hwang added. The finding that 10 percent of respondents did not perform an apnea test, if it represents the actual state of practice with patients being assessed for brain death, is especially striking, independent experts said. “Because apnea testing is not an elective part of brain death determination, its omission, when it can be performed safely, is a serious quality deficiency,” Dr. Bernat told Neurology Today. •. Braksick SA, Robinson CP, Gronseth GS, et al Variability in reported physician practices for brain death determination http://n.neurology.org/lookup/doi/10.1212/WNL.0000000000007009. Neurology 2019;Epub 2019 Jan 25. •. Russell JA, Epstein LG, Greer, et alon behalf of the Brain Death Working Group. Brain death, the determination of brain death, and member guidance for brain death accommodation requests http://n.neurology.org/content/early/2019/01/02/WNL.0000000000006750. AAN position statement. Neurology 2019; Epub 2019 Jan 2. •. Wijdicks EF, Varelas PN, Gronseth GS, Greer DM. American Academy of Neurology evidence-based guideline update determining brain death in adults: Report of the Quality Standards Subcommittee of the American Academy of Neurology http://n.neurology.org/content/74/23/1911. Neurology 2010; 74: 1911–1918. 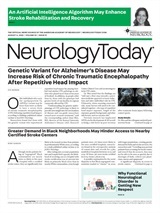 Neurology Today19(3):12-13, February 7, 2019.